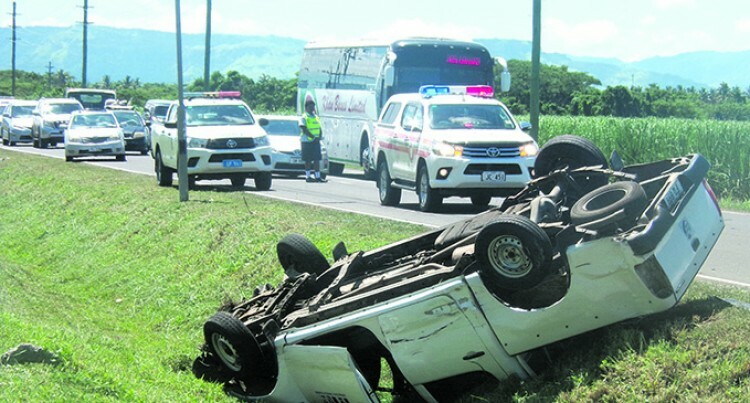 For a few brief moments Joana Koroilavesau feared the worst had happened to her youngest grandchild Anthony, 2, as their vehicle sat upside down in a drain after an accident at Lomolomo between Nadi and Lautoka. The wife of the Minister for Fisheries, Semi Koroilavesau, recalled how she called out to her three grandchildren in their vehicle lying upside down in a drain after it had tumbled twice. She especially feared the worst for the youngest grandchild, two-year-old Anthony who had not made a sound when the vehicle rested on its roof. What seemed as a normal drive to Lautoka yesterday morning, to attend a family wedding, by Mrs Koroilavesau, her niece Ana, daughter-in-law Kara and grandchildren Joshua, 6, Vive, 5, and Anthony almost turned tragic. Mrs Koroilavesau was driving with her niece in the front passenger seat and her daughter-in-law and grandchildren in the back seat. The state of the family company vehicle, a Holiday Tours, Travels and Transfers’ twin cab was sitting on its roof inside the drain separating both lanes of traffic on the Queens Road at the Lomolomo flat. “I saw this private car hit the front side of our vehicle,” she said. It is believed that drivers of both vehicles lost control and a bus following them hit their vehicle which sent it tumbling twice before it ended up in that position in the drain. “I immediately started calling out to my daughter in law to check and call on the kids,” Mrs Koroilavesau said. “Shortly after, I heard Joshua and then after my granddaughter Vive crying and shouting. “I could not hear my little grandson Anthony crying and the thought came to my mind that he was gone. Mr Koroilavesau, who was attending a meeting at the Fisheries Department in Lautoka, was called by his wife soon after the accident. “I went to Lomolomo and after I saw the condition of the vehicle I was relieved that nothing happened to them,” he said. Police spokesperson Ana Naisoro said all involved in the accident were taken to hospital for medical examination, but there was no serious injuries and sent home.